Browse our most common questions below or contact us directly to have a chat, we’re here to help. Do I need to qualify to participate on EquityZen? No. EquityZen provides liquidity to private company shareholders and does not facilitate fundraising for companies. What is your minimum investment size? Our minimum investment size is $20,000. You will be charged, through EquityZen Securities LLC, a one-time Sales Fee, which generally scales based on the size of your investment. Investments up to $500,000 will be charged a 5% fee; investments of $500,000 up to $1 million will be charged a 4% fee; and investments of $1 million and up will be charged 3%. For example, if you were to invest $50,000, your total wire would be $52,500 ($50,000 + 5% x $50,000). Currently, we do not charge Carried Interest nor a recurring management fee on non-actively managed funds. EquityZen Securities LLC is a SEC-registered broker-dealer and member of the Financial Industry Regulatory Authority. The Sales Fee is subject to partial or complete waiver by EquityZen Securities LLC and/or its affiliates. The fee structure is set and the terms must remain the same for all investors in a given Fund. How are the investments structured? Investors are Members of a fund (organized as an LLC) that purchases a specific company's Shares. EquityZen acts as the Managing Member of this fund. The assets owned by the fund (and its Members) are the Shares which the fund has purchased from shareholders via a Share Transfer. What is a Live vs. Preview Offering? Live offerings are offerings that are currently available on EquityZen for investment, you can learn about the specifics of a given deal (such as underlying share price, valuation, price history, revenue estimates, and a capitalization table) on our platform. Preview Offerings mean that we are gauging investor interest in that company. You can indicate that you're interested in investing in that company by clicking the company's tile and then pressing "I'm Interested". Am I purchasing an option? No, we purchase fully vested shares of companies. In some cases where our shareholder has not yet exercised their stock options, we would require the seller to exercise these options before proceeding. Once the company turns around their exercise and issues the share certificates we would move forward with a share transfer. Is it difficult to find a shareholder to part with their equity? Who are you buying these shares from? The majority of our shareholders find us. We enter into a Letter of Intent to move forward on a transaction once we have found buyers. Our sellers are current and former employees, early investors, and advisors. They are typically selling only a portion of their holdings in order to 1) cover costs associated with exercising and paying taxes on the remainder of their shares 2) life events such as purchasing a home or preparing for a child and to 3) diversify their holdings. Why can't I just buy the shares directly from the shareholder? Secondary investments in private companies require much more legwork than your typical public stock transaction (for example on Fidelity or Charles Schwab). For one, every transaction must go through the company when shares change hands (imagine telling IBM or Microsoft every time you bought their shares). And the process requires providing specific language governing the transaction; each company's process is different. Finally, a number of documents must be compiled by the shareholder (a lot that shareholders don't even know about, which is why we made a shareholder checklist on our blog). I am not located in the United States. Can I invest through EquityZen? What proof do I need to provide to begin my investment? Balkans, Canada, China (excluding Hong Kong) Myanmar, Belarus, Burundi, Central African Republic, Cote d'Ivorie, Cuba, Democratic People's Republic of the Congo, Lebanon, Liberia, Libya, Somalia, Ukraine/Russia, Venezuela, Yemen, and Zimbabwe. *This is not an exhaustive list. Foreign investments will be reviewed on a case-by-case basis. Due to comprehensive sanctions, we cannot accept investments from investors in the following countries: Crimea, Iran, North Korea, Sudan, and Syria. What is the definition of a US person (as defined by the IRS)? The term ''United States person'' means: a citizen or resident of the United States, a domestic partnership, a domestic corporation, any estate other than a foreign estate, or any other person that is not a foreign person. This also includes a trust if a court within the United States is able to exercise primary supervision over the administration of the trust, and one or more United States persons have the authority to control all substantial decisions of the trust. Can I invest with a self-directed IRA? Yes. EquityZen welcomes investments from self-directed IRAs like Millennium Trust Company and IRA Services. How are you different from other secondary marketplaces? EquityZen takes a technology-driven approach, allowing for secure transactions with audit trails, and also reducing costs. Do I own the stock in these companies? No, you'll be a member of an LLC that owns the shares of the company. How do you price the shares? We use the last round of financing's pricing as a guidepost. Ultimately, the seller chooses the price at which an opportunity is listed on the platform. Other factors include investor demand, access to the company, other secondary transactions that have occurred, publicly available information etc. Can you provide the company’s financials, exit strategy, and prospectus? Unfortunately, we typically do not have access to the company's most recent financials, or their investor presentation. We leverage the due diligence performed by the company's most recent investors and base our offerings on the price those investors paid. Any information that is provided regarding an investment opportunity is publicly available or is derived from publicly available information. Given the lack of transparency in these markets, among other reasons, the investments on the EquityZen platform do not suit all investor profiles. What kind of paperwork do I receive as an investor? Our paperwork is similar to that of any fund investment, but simpler. An investor would sign a Subscription Agreement, through which they would purchase an interest in the fund (company). In addition, an investor would also complete a W-9 (W8-BEN for foreign investors) once for our records. On an annual basis, Investors would receive a Schedule K-1 that updates them on their investment. All legal and financial documents are prepared with the involvement of outside counsel or accountants, as applicable. What is a Proof of Residence and why do I need to submit one? During compliance checks, sometimes we are required to conduct additional follow up and obtain a Proof of Residence document to show the address on the investment is in fact correctly associated with the investor. A Proof of Residence document can be a utility bill, bank or credit card statement, mortgage statement or rent invoice, or even a driver's license. Please note: The Proof of Residence should be dated within 12 months of your investment and the address should match the address on your My Personal Info page. What are the commitments to investing in a deal? Is the Term Sheet binding? We collect commitments to our investment opportunities based on signed Term Sheets. Our Term Sheet is by nature non-binding. However, we view them as formal commitments to the Fund so we can reserve allocations based on supply. We keep track of all Investors who request and sign Term Sheets. If you do sign a Term Sheet for an investment we will provide a final date for which you can submit a completed investment subscription to finalize your commitment. You will be subject to a $500 termination fee if you cancel your investment after completing the investment process. The investment process is completed once you have clicked "Submit" from the Transaction Summary page. If an exercise of the Right of First Refusal by the issuer of the equity interests that are the subject of the Fund's investment occurs or if EquityZen fails to complete your investment due to other company restrictions, you will not be charged a termination fee. While your investment is subject to the Termination Fee, an indication of interest or Term Sheet is not binding. What does “Aggregate Commitments” on your Term Sheet mean? The aggregate commitments is the total dollar amount committed from all investors in the Fund. It represents the expected size of the fund. As an investor you are a member of the Fund and your investment is represented by your Capital Ratio or percentage ownership of the Fund (your investment size to the entire size of the Fund). What does "Capital Ratio" on your term sheet mean? Your subscription amount on your term sheet is reflected in a capital ratio, which is the ratio of your capital account balance to the sum of capital account balances of all members of the Fund. In other words, it illustrates the percentage of the total fund that your membership represents. Once I invest, will I receive any formal or legal documents stating my investment? Yes, you will receive Subscription and LLC Agreements indicating your membership in the Fund. You will also receive closing documents from EquityZen outlining the details of your investment. How is my investment treated for tax purposes? Your investment in an EquityZen fund would be taxed like any other fund investment. Our LLC funds are taxed as partnerships, meaning that the fund’s gains and losses would pass through to its investors. Generally, if an investment is held for more than one year before its disposition, any income resulting from that investment would be taxed at the long term capital gains rate. The United States tax code allows certain types of entities to utilize pass-through taxation. This effectively shifts the income tax liability from the entity earning the income to those who have a beneficial interest in it. The Schedule K-1 is the form that reports the amounts that are passed through to each party that has an interest in the entity. A K-1 will be issued only when there is a taxable event. This means that unless there was a change of control or distribution of exit proceeds during the tax year, there will not be a K-1 for that fund. Note: we are not tax experts and have provided this discussion for informational purposes only and not as personal tax advice. You should consult your tax advisors for guidance specific to your circumstances. Will I be receiving any financial updates for my investment? How often? Yes. Our third party Fund Administrator will issue K1's annually. EquityZen will also update you on any material impact to your investment (company news, new funding rounds, secondary transactions or indicators to new valuation). What is the "right of refusal" clause? Our stock purchase in each transaction is subject to the company's Right of First Refusal (ROFR), which, if exercised, will prevent the consummation of the Stock Purchase by the Fund. In this case, any transferred investment of yours (held in escrow) would be immediately returned. In short, the Right of First Refusal is the company's right to purchase the shares from the shareholder on the same terms as our offering. The company has up to 30 days to make the decision upon us submitting our Bona Fide Offer via a Transfer Notice (they may also waive their right, in which case we can proceed immediately). What is the turnaround time for my investment? Once we receive full commitments from investors we will stop accepting allocation and will approach the company with our deal terms. The company has a Right of First Refusal which allows them a thirty day (typically) period to purchase the shares on the same terms as our offer. You can typically expect a transaction to close 4-6 weeks from the time we "close" our Fund and stop accepting investor commitments. By submitting your term sheet you agree to complete the investment process within one week of being informed by email that it is available to be completed. In the event you do not complete it within one week of notification, your investment allocation may be reallocated to another investor and you may be charged a $500 termination fee. When do I need to complete my investment and send funds? We typically market our offerings for 3 weeks or until an offering is fully allocated. We begin accepting funds at the end of this period. If there is significant demand for the offering we will begin accepting subscriptions immediately and you would have until the Deadline for Confirmation, as listed on the Offering Document, to submit a completed subscription. By signing a term sheet you are reserving an allocation and must complete the investment process before the Deadline for Commitment. You will be subject to a $500 termination fee if you cancel your investment after completing the investment process. The investment process is completed once you have clicked "Submit" from the Transaction Summary page. While your investment is subject to the Termination Fee, an indication of interest or Term Sheet is not binding. In most cases, we send a 7-day notice before the funds transfer date. We do our best to determine this date while we are collecting subscriptions. The funds transfer date is determined by whether we anticipate the Right of First Refusal to be waived or if we are not sure whether the company will or will no waive the Right of First Refusal. How long can I hold this investment? If a company IPOs, we can transfer the shares to your brokerage account for you to hold or sell at your preference. Not all companies will IPO or be acquired. You should be prepared to hold your investment for an indefinite period. What happens if a company in which I invested goes public? Will I be able to sell my shares on the day of the IPO? Will the shares be transferred to my brokerage account? Generally, the company will use a transfer agent, who will hold custody of the pre-IPO shares. After the completion of the IPO, the shares purchased by the Fund will be held with the transfer agent. Once the lock-up period expires, or one year has passed since purchase, EquityZen will either (i) transfer the shares from the account of the fund to a brokerage account you designate (after which you can do whatever you like with the shares) or (ii) sell the shares in the open market and deliver to you your portion of the proceeds. When can I expect the company I’m in investing in to go public or get acquired? We cannot guarantee an exit nor a timeline for any of our offerings. However, the majority of investment opportunities on our platform are companies who have received institutional financing from late-stage or growth funds, who have a typical investment horizon of 2-5 years. Given the relative illiquidity of investments available via the EquityZen platform, they are not suitable for all investor profiles. Please consider your investment time horizon when investing through EquityZen. Do I have the option to sell before the company goes public? What are the methods if I want to exit or cash out my investment? While we view your membership interest as a long-term commitment, in most instances, your LLC ownership is transferable after a six month holding period with the permission of the manager. We would seek to accommodate the situation by working with you to find a replacement buyer among our investor base. However, we cannot guarantee that we will ultimately be able to find a buyer. Because we cannot guarantee a buyer, and because there can be no guarantee of when an IPO or other exit will occur, and you should be prepared to hold your investment for an indefinite period. The company I invested in gets acquired: what happens next? The proceeds received by the shareholder (stock and/or cash) would be transferred to the LLC, after which EquityZen (the Managing Member) would distribute these proceeds to the Investor. Can there be a secondary offering and if so how much of my potential ownership will be diluted? A company you invest in may very well raise an additional financing round(s). While your percentage ownership would decrease (as a result of having more shares in the market), the value of your holdings may still increase if the company is raising at an increased valuation. Is there a share price on the day I decide to sell? In short, yes there will be a share price at the time of a liquidity event (either through acquisition or IPO). Should you seek to exit your investment early (before a liquidity event) we cannot guarantee that there will be new information to corroborate a new share price such as a new funding round. For this reason, we cannot guarantee the ability to find you a buyer to exit your investment before a liquidity event. EquityZen offers private offerings, open to accredited investors only. While some platforms offer non-accredited investors the opportunity to invest (such as under the JOBS Act’s Reg. A+ or Reg. CF), EquityZen does not. If I invest and something happens to EquityZen, what happens to my investment? Investments through EquityZen are structured through fund vehicles. EquityZen has engaged a fund administrator, who has been contracted and paid to administer EquityZen funds, including providing K-1s and making distributions to investors for the life of a given fund. In the event that EquityZen were to become insolvent, we would engage a back-up manager to step into the platform's role as fund manager. The back-up manager would assume EquityZen's role as manager, doing things like coordinating with the administrator. EquityZen has allocated capital to execute this plan. Do I need to verify my accreditation status with supporting documentation? 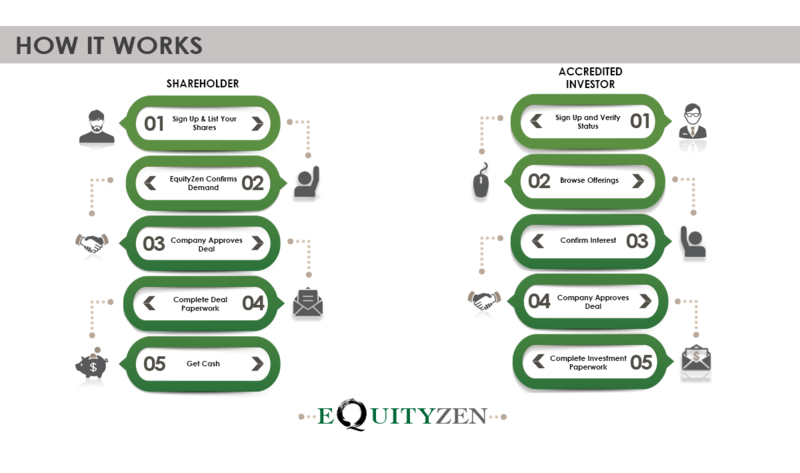 EquityZen conducts private placement transactions in compliance with Rule 506(b) of the SEC's Regulation D, and all that you are required to provide regarding your status as an accredited investor are (a) an Accredited Investor Questionnaire, (b) an Investment Suitability Questionnaire, and (c) a binding representation from you regarding your status. Additional documentation, such as income tax returns and salary verification letters, are not required. EZIA - What is an EquityZen Investor Account? An EquityZen Investor Account is a savings account that allows you to earn interest whilst investing on the EquityZen platform. Make investments and receive proceeds from cash based exits (such as acquisitions) through a single, unified account that is fully integrated with the EquityZen platform. In addition, you will gain enhanced access to EquityZen investments (such as a lower minimum investment) when you deposit the required balance. EZIA - How does it work? Sign up for an EquityZen Investor Account on our platform, connect an external bank account and transfer funds through our automated, fully digital account opening process. Once funds have settled you’ll start to accrue interest and qualify for enhanced access if you have the required balance see What is enhanced access? How do I qualify? EZIA - How often is interest deposited? Interest compounds daily at 1.5% APY and is deposited monthly. The interest rate is subject to change depending on the federal funds rate. EZIA - Are there fees or a minimum balance? There are no fees associated with opening or closing the account, and no monthly service charge. There is no minimum account balance to earn interest. However, there is a minimum balance to qualify for enhanced access, see What is enhanced access? How do I qualify? EZIA - Is there a maximum balance? There is no maximum balance for this account. You can deposit as much as you wish, however withdrawals and deposits will be subject to weekly, monthly and yearly limits, currently $250,000 / week, $500,000 /month and $1,000,000 / year. EZIA - What is enhanced access? How do I qualify? Users who qualify for enhanced access will (i) be able to invest with a reduced minimum of $10,000 in eligible deals, (ii) gain early access to selected high-demand deals and (iii) benefit from greater waitlist prioritization for oversubscribed deals. To qualify for enhanced access, users must maintain a balance of $50,000. Users can count up to $40,000 of completed transactions against this amount. For example, a user with $100,000 of completed transactions would have to maintain at least $10,000 in their account to qualify. EZIA - Is the account FDIC insured? Yes. Funds in your EquityZen Investor Account are held at Evolve Bank & Trust, an FDIC insured bank. This means that funds deposited are insured up to the maximum allowed by law, which is currently $250,000 for an individually-owned account. EZIA - Is the interest taxed? Yes. A 1099 INT will be available for download for each Investor Account holder during tax season. EZIA - Will I receive account statements? Statements will be made available to download on the 11th of every month. In addition, you’ll be able to view your current balance and historical transfers on the EquityZen platform. EZIA - How many times can I withdraw my funds? Since the Investor Account is a savings account, withdrawals can only occur up to six times per month. These are standard banking restrictions you would have with any savings account per federal law. You can deposit additional funds as many times as you’d like per month and this does not count towards your 6 transaction limit. In the event you do reach a transaction limit within a calendar month, you will still be able to fund EquityZen investments. Additional funds will simply be pulled from a different bank account. EZIA - Will my trust/LLC/US entity be able to open an EquityZen Investor Account? We’re working on enabling entities to open up accounts. Sign up to our waiting list to be notified when we’re ready to accept registrations. In the meantime you can continue to invest on EquityZen as usual. EZIA - Are non-US clients able to open an EquityZen Investor Account? Right now, this product is limited to US clients. However, we may expand this offering to international clients in the future, so we encourage you to sign up for the waitlist if you are an international investor and would like to participate. Formed by a U.S. person principally for the purpose of investing in securities not registered under the Act, unless it is organized or incorporated, and owned, by accredited investors who are not natural persons, estates or trusts. What is a Qualified Purchaser (QP) under the Investment Company Act? Securities, including stocks, bonds and notes, other than securities of an issuer that is under common control with the qualified purchaser. Real estate held for investment purposes. Commodity futures contracts, options or commodity futures and options on physical commodities traded on a contract market or board of trade, held for investment purposes. Physical commodities (e.g., gold and silver), with respect to which futures contracts are traded on a contract market or board of trade, held for investment purposes. Financial contracts (e.g., swaps and similar individually negotiated financial transactions), other than securities, held for investment purposes. For an investment company or a commodity pool, any binding capital commitments. Cash and cash equivalents held for investment purposes. Neither cash used by an individual to meet everyday expenses nor working capital used by a business is considered cash held for investment purposes. No results... Try broadening your search. How are your transactions structured? EquityZen transacts only via company-approved Share Transfers. What are the requirements for a private company to be included in EquityZen's offerings? Typically, our investors are looking for investments in later stage technology companies with a profile of over $50M in VC funding from top quartile firms, Series C or later, with the objective of finding investments that may exit in the next 2-5 years. Not all companies on the EquityZen platform will achieve an IPO or other exit, and not all exits will result in successful investments. What is the transaction minimum? Our minimum transaction size is $175,000. Your shares can be pooled with another shareholder of the same company should your individual holdings not meet the minimum required. Does the company need to waive its ROFR as part of the deal? Yes, if the company has a ROFR, the ROFR would need to be waived or the company would need to not exercise its right in order to complete a share transfer. What does the process look like if the company has a ROFR? If we are conducting a share transfer and the company has a Right of First Refusal (ROFR), which is the company's right to purchase the shares from the shareholder on the same terms as our offering, we will work with the company to facilitate the transaction. The company will either decide to waive the ROFR, let it expire, or purchase the shares directly from you on the same terms. Typical ROFR periods are 30 days but it is dependent on the company. Can I sell unvested shares? EquityZen only provides liquidity for vested shares. Can I sell my options? EquityZen only provides liquidity for vested shares. However, the liquidity can be provided in conjunction with the exercise of vested options. 2) What needs to happen in order for you to sell your shares to a third party? Typically, these documents include your Stock Certificate (if your company issues one), a signed Option Exercise Notice, and/or a signed Shareholders Agreement. We will not ask you for sensitive company information. We will review your ownership documents to (i) verify your ownership and (ii) verify that your participation on our platform does not create any issues in respect of agreements you have in place with the company. We use the last round of financing's pricing as a guidepost. Other factors include investor demand, other secondary transactions that have occurred, publicly available information etc. Please note, as the shareholder you set the ultimate price. If there is a price/valuation you require we can seek that. We will provide you with our analysis of the company's cap table and share price history as well as relative investor interest. The fee structure is straightforward. A Placement Fee is charged to you in connection with the sale of your shares. The Placement Fee is paid to EquityZen Securities LLC ("EquityZen Securities"), our SEC-registered affiliated broker-dealer and member of FINRA. Where possible, your Placement Fee will be netted from the purchase price for your shares, which is held in an escrow account. This means that at closing, you will receive the purchase price for your shares less any Placement Fee that is due. The Placement Fee will be held in the escrow account, pending closing and satisfaction of other applicable contingencies. The Placement Fee will then be released from escrow to EquityZen Securities. Where netting of your Placement Fee is not practically feasible, your Placement Fee is required to be paid immediately upon closing of the sale of your shares. The precise mechanics will be disclosed further in the Placement Agreement you sign in connection with the sale of your shares. Please consult our deal team if you have any questions on whether your fee will or will not be netted from your sale proceeds. Please note that there may be additional costs associated with completing a sale that are not imposed by or paid to EquityZen. Your company may require a legal opinion in connection with a sale, which typically costs $1000-$1500. We can refer you to an attorney who issues these opinions if you need. Your company may also charge you a transfer fee to cover their costs associated with a sale, which typically ranges between $1000-$3000. Do I need board level approval to "sell" my shares on EquityZen? It depends on the company and the provisions it has in place regarding employee stock options. Our deals typically do not require board approval. What happens if EquityZen goes away? We will engage a back-up manager to step into the platform's role as fund manager in the unlikely event EquityZen becomes insolvent. The back-up manager would ensure orderly administration of the fund and distribution of its assets. Will the company be informed about the transaction? Yes. Part of our process is to ensure that each transaction is in accord with all company share transfer policies. Our goal is to facilitate a smooth transaction that is mutually agreeable to all stakeholders including the investor, the selling shareholder, and the company. Notification mitigates the risk that the transaction will not be recognized by the company. How is a transaction treated for Tax Purposes? The transaction is viewed as a disposition (sale) of the shares in the year we transact. Outside tax attorneys have vetted our tax treatment and have provided a memo, which is included in the documentation you would receive from us. Let’s use an example. Let’s say you exercise your options at $1 per share and hold the shares for over one year. In 2015, you transact with us at $5 per share, and in 2016 the company goes public at $10 per share. In 2015, you would report the income on the transaction and pay taxes on $4 per share ($5 - $1). You would be taxed at the long-term capital gains rate since you held the shares for at least one year. *Please note that we cannot provide tax advice. Consult your financial or tax advisor for more specific details and confirmation of your situation. Similar to taxation on any other income, the IRS requires individuals to pay taxes on equity compensation. An 83(b) election is an option implemented by the IRS that allows stock holders to decide (at the start of a vesting period) to pay income taxes on the present value of the equity for the entire amount that will vest. The 83(b) election is valuable if you believe that the value of the company (and subsequently the equity) will continue to rise as you’re pre-paying your tax liability on a lower valuation and then paying long-term capital gains on the increase. If the company’s value decreases however, you’ve prepaid at a higher valuation and overpaid taxes. This is for information purposes only and does not constitute tax advice. Please consult a tax advisor for advice specific to your circumstances. Investors are Members of a fund (organized as an LLC) that purchases a specific company’s shares. EquityZen acts as the Managing Member of this fund. The assets owned by the fund (and its Members) are shares the fund has purchased from current company shareholders. No. EquityZen provides liquidity solutions to private company shareholders and does not facilitate fundraising for companies. Why should I offer my employees liquidity? Employees’ net worth is increasingly concentrated in company stock, yet their liquidity needs aren’t on the same timeline as that of the company. Employees will have to pay down educational debt, purchase homes, and prepare for life events like the birth of a child. Left unaddressed, employee liquidity issues can adversely impact your company in numerous ways, impacting morale and retention, and lack of control through grey-market brokered transactions. How does this affect our Cap Table? EquityZen uses an LLC Fund structure and are only one new entrant to the cap table. What Company information do investor(s) receive? Our investors are only given publicly available information to make their investment decision. This includes notable investors, recent funding rounds, total funding, and any notable media or press releases. In order to access deal terms (such as deal size, valuation, share price, and share type), an investor must first be an accredited investor as well as sign an NDA with us. Furthermore, deal information is only sent to investors who have expressed interest in a specific company. What voting or information rights are transferred to a new investor(s)? None. Our investors only receive the underlying economics of the shares and do not have access to any information or voting rights. All of these rights stay with the company, only allowing a passive investor economic exposure to the company. Can I control who can sell? Yes. Our software tool will allow you to nominate shareholders for liquidity. You control who sells, how much, and when. Can I control how much they can sell? Yes. Our software tool will allow you to control the total dollar amount as well as the individual percentage of a shareholders stock. Can I control when they can sell? Yes. Our software tool will allow you to choose the start and end dates between which an employee can sell shares. Who are the investors on your platform? Our investors are all verified Accredited Investors under a NDA with EquityZen. They include professional angel investors, high net worth individuals, and institutional investors of all sizes. Through EquityZen, your company can get introduced to strategic investors and partners. Investments are marketed to our Investor base via a newsletter as well as the platform on our website. Unless the company wishes to provide otherwise, only publicly available information is provided to investors. Drop us a message we will get back to you in less than a day. Schedule a consultation with an EquityZen Representative today. Looking for more information? We post new research weekly.